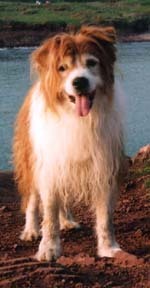 Jules started life in January 1991 as the only brown and white pup in a litter. 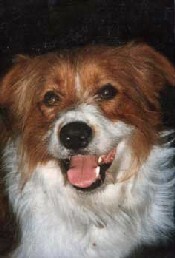 Bred from a collie sheepdog and a small long haired terrier, he was originally my girlfriend Celia's dog. When he was 2 years old, she asked me to take him on permanently, mainly due to my outdoor lifestyle. Jules was never formally trained and didn't know the meaning of the word 'sit'. 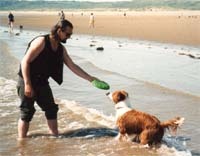 But, over the years, he became a very obedient dog, and never needed a lead. 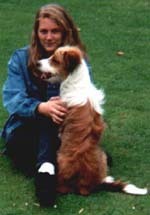 Pictured right with Celia, his first owner. It was here at this tree in the Castle Grounds below that I decided to take Jules on permanently. But at the time, I didn't realise that it would be for the next 16 years. Jules journeyed to the vet in my van when he was only a few days old, so he always felt completely at home in my vans. He would panic when left indoors by himself, but in the van, he knew I wouldn't be too far away. 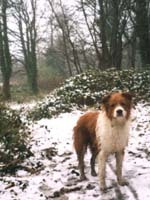 He became an ideal companion around the streets and parks of Cardiff. He ran alongside my bike with limitless energy. We also covered countless miles on the Taff Trail between Cardiff and Brecon. Near Merthyr at the Cefn Coed Viaduct My 'outdoor lifestyle' meant trips to the coast. 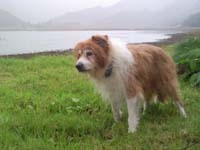 So, Jules enjoyed regular camping adventures in West Wales and the Gower, Devon and Cornwall. 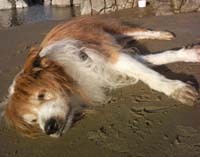 He got used to all the best beaches during the wonderful summers we had over the years, and the sea breezes kept him cool. In fact, his frisbee addiction got so bad that a pusher at a pop festival drugstore tried to tempt him with a pill too big to swallow. I can't remember where the festival was, so it says a lot for my brain at the time. After that experience, Jules started giving pixies and elves rides on his back at Barry Knap. It was nearby and handy for him to chill out on many afternoons. 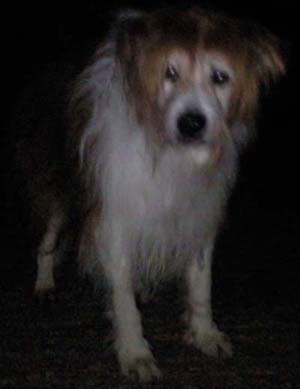 When camping, he loved to lie outside my van awning at night and just watch, listen and smell the atmosphere. But he didn't much like open fires! I was usually the one taking photos, here's a rare picture of us together overlooking Worms Head, Gower. I've had a shave since then. We spent countless camping holidays in West Wales, usually staying south of Pembroke near Bosherston and driving to beaches at Freshwater West and Marloes. This pic was taken further north near Whitesands at St.Davids. 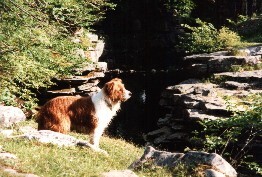 This pic shows him in the Castle grounds when he was about 6 yrs old. It wasn't just the warm summers that Jules enjoyed, he also loved the snow. I don't know whether he realised he was posing for a shot or maybe just quizzically wondered why I often stopped to hold a square black metal object and point it in his direction. Upon reaching his teenage years, (equivalent to a 70yr old), health concerns naturally challenged his fitness. First came liver problems, so my natural response was to trawl the internet for information and advice. After that, he was put on a natural food diet from that day on. Balanced and varied. 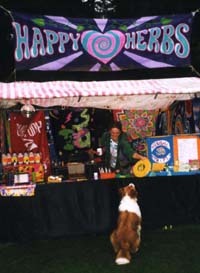 No more cans of dog food, but plenty of wholegrains, vegetables and quality meat along with herbal remedies and supplements. I would also avoid giving him any medication which contained NSAIDS. I even used a food processor to mash up raw vegetables to mix with his meals. 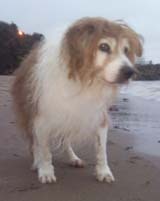 This overall regime seemed to reverse the health problems and enabled him to run around and carry on as before. As he grew older, he became an even greater friend. He loved the places I loved, and trotted besides me as I cycled. But, inevitably he was getting older, and so the healthy regime could only help so far. When he developed heart problems, the diet had to be altered again to suit the medication. 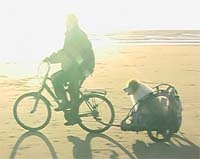 Arthritis was also creeping in, so I obtained a dual buggy and with my father's help, converted it into a dog carrier which attached to my bike. I could continue to transport him to out of the way beaches and also get the exercise that I needed. 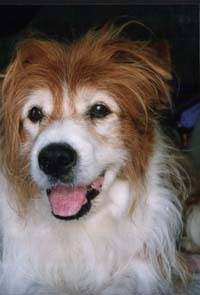 At 17 yrs old, Jules was now diagnosed with renal failure, so I knew he was on borrowed time. I again altered his diet to suit, but it was inevitably getting more difficult. Last memorable adventure ; We spent all of September 2008 motor caravanning around the UK ending up in the Scottish Highlands. The Soppy Stuff ! The Right Time ? The vet told me that I would know when the time was right, and he was right. I could see that Jules was beginning to suffer and so arranged an appointment for November 16th. When the day finally arrived, thankfully it was bright sunny weather, although understandably cold. We spent that last day at Porthcawl, but he was like a rag doll and couldn't even stand up. I'm sure Jules was wishing to leave the world by then. I stopped at Ogmore, another favourite of ours to say my goodbyes. When we arrived back in Cardiff, I walked into the vets and tried to say that I had an appointment for Jules, but I couldn't speak. I tried so much to say something, but it was impossible, nothing would come out. I guess the receptionist was used to dealing with grief, and was very understanding. I sat there waiting with Jules like a rag doll over my knee, with concerns that the appointment I had made was with an unfamiliar vet, so you can imagine my relief when my favourite vet appeared and called us into the room, she had purposely switched her rota. From there on, it was toys and tears and gentle words of love and affection. I couldn't have asked for a better departure. As the vet said, I would know when the time was right ! It's hard work digging a hole deep enough for a medium size dog. But I always wanted a burial for him. I've made a rockery above the grave with golden coloured grasses and white heathers, just like the colours in the hairs of Jules coat. 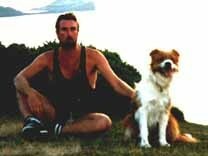 Some might think, what a lot of fuss over a dog, but Jules was the best companion I ever had and he gave me unconditional love that I've only ever received from close family members. Thank you Jules for the special times we spent.